RDP is pleased to announce our certification on a full two-way interface to Expedia using Expedia QuickConnect. If you are already using Expedia, the interface will automatically update availability and rates and potentially provide Expedia with last room availability to ensure your selling as many room nights as possible. Expedia QuickConnect provides an electronic interface for RDPWin customers to send Expedia updates on availability (inventory) and rates automatically. For customers not currently working as an Expedia Partner, go to www.joinexpeida.com to request a contract. Why Use the Expedia Interface? Reduce manual labor: 42,000+ reservations are delivered electronically on a daily basis to Expedia partners providing instant visibility and accuracy. Obtain greater control over your inventory: manage availability and rates from RDPWin directly. Enhance your revenue by making your availability more attractive to the guests. Save time and money by automating daily tasks allowing the property to focus on revenue management and promoting your property. Eliminate the hefty fees charged by GDS providers to link you to Expedia. Gain greater visibility on the Expedia website by working directly with Expedia. Contact your Expedia Account Manager. Expedia charges various fees for their services and the interface. Please contact sales@expedia.com directly to learn more about pricing. RDPWin Monitor must be installed on any workstation with Internet access. Purchase the Expedia interface from RDP: $6,000 plus an additional $900/year in support. Contact RDP Sales for more information. Contact your Expedia Account Manager to begin the process of interfacing with RDP. Schedule a time with RDP Support to begin the implementation of the Expedia Interface. A fixed number of room nights contracted with Expedia. 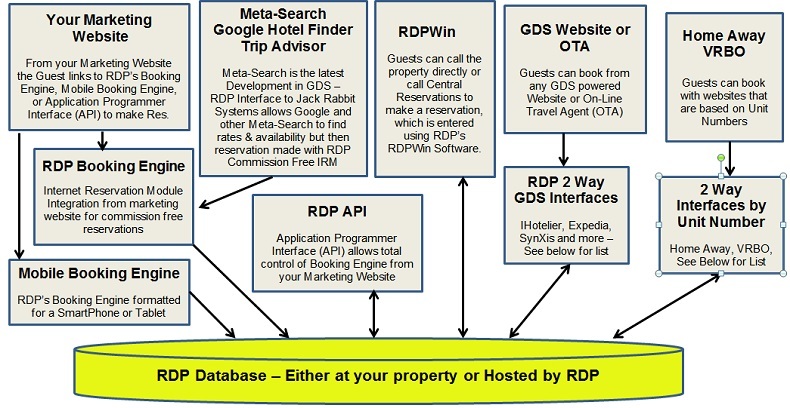 A group block called 'Expedia' is set in RDP which can be changed as the RDP customer desires. A combination of the above whereby the RDP customer has a fixed contract for a certain number of rooms each night plus an additional flexible number of rooms which can be changed as the customer desires. Room rates available to Expedia are managed within the RDP Software, and pushed to Expedia. Room rates are determined by the contract negotiated with your Expedia Account Manager. RDP conforms to the Expedia rate guidelines. Please contact your Expedia Account Manager for more information on this topic.